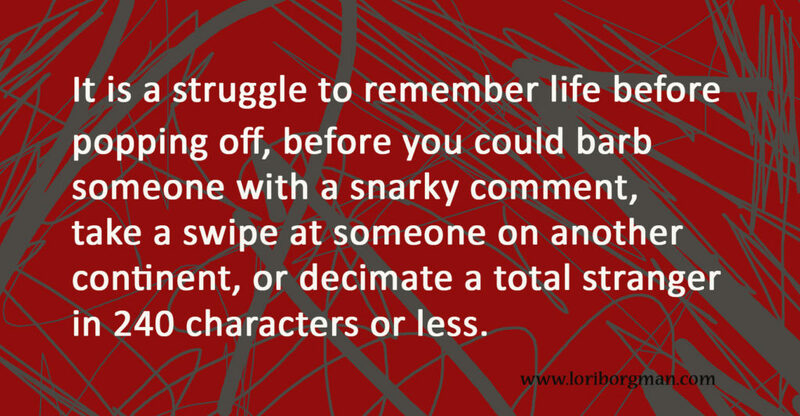 It is a struggle to remember life before people began popping off, before you could barb someone with a snarky comment, take a swipe at someone on another continent, or decimate a total stranger in 240 characters or less. In an effort to limit my exposure to all the popping off, I make it a practice to avoid the comments sections that follow online news stories. Except for when I don’t. My self-control needs work. I fall off the wagon every now and then and read a few comments. Then, there I sit, picking crumbs out of the computer keyboard, wondering if there is intelligent life left on the planet. We all have opinions. People always have had opinions. Just like people have always had conflicting opinions. But there’s something different about disagreements today. Perhaps it’s the pseudo anonymity that spurs us, or the adrenalin rush of speed, seeing thoughts fly from our fingertips into cyberspace. Whatever the impetus, we seem to be—and I don’t know how to put this gently—a bit more, well, rotten. Being that I can be given to popping off, I once wrote some dictums on an index card that I keep in a desk drawer. I would do well to look at the card more often and I tell myself I must. But then that old problem with self-control pops up again. Timely is not about being the first out of the gate. We’ve mastered that one. Timely is about finding the apt moment. Maybe I don’t need to say what I wanted to say right now. Maybe the opportunity passed, or maybe what I have to say would be better heard at a different time and in a different setting. Is it true because it came from my friend’s former co-worker with an aunt in Montana whose daughter, now living in the D.C. area, does yoga with the niece of the person under discussion? Or is it true because I heard it with my own ears and saw it with my own eyes? I know—what if it’s not kind, but it’s true? Truth cancels out kindness, right? Not so fast. With some finesse, grace and thoughtfully chosen words, it is possible to speak the truth with kindness. I’ve seen it done. Once. I think it was on a Tuesday. 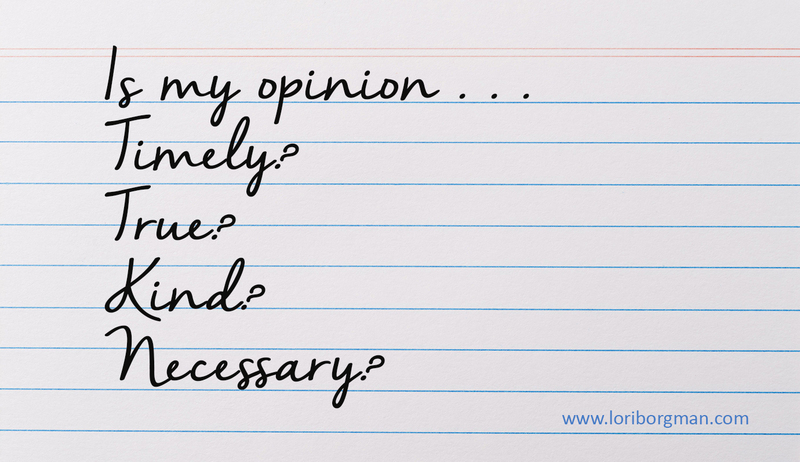 As much as I’d like to think what I have to say is necessary, it’s probably not.